The Poppies will be crowned champions if they beat play-off contenders Alvechurch at home on Saturday. 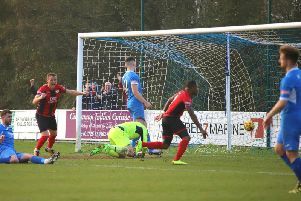 The excitement is already bubbling away with a big crowd expected to be on hand to see if Marcus Law’s team can get over the line after they set up the opportunity with a last-gasp 1-0 success at Leiston last weekend. Mahoney has been at the helm of the club for the past two years after owner Ritchie Jeune stepped down as chairman. And he has overseen two successful seasons as the Poppies just missed out in the play-off in the last campaign. But they are on firmly on course to secure automatic promotion to what they expect to be the Vanarama National League North. And Mahoney insists it is boss Marcus Law, his staff and the players who must take the credit. “There’s certainly a buzz around Latimer Park,” the Poppies chairman said. “And whilst we’re taking nothing for granted, we have to admit that confidence is understandably high that the season will end with promotion. 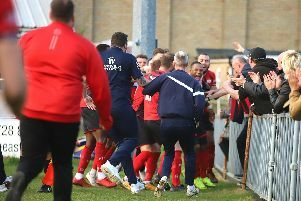 “Our fans have been calling it since the end of last year, in fact some of the more optimistic ones were chanting it after our opening day win away at Hitchin Town! “I honestly thought that the title would be decided much later but that’s easy to share now”. “When you think where this club was five or six years ago, it’s amazing what has been achieved and what you can do with an owner like Ritchie Jeune. “But this year the credit has to go to Marcus Law, (assistant-manager) Richard Lavery and the squad and ultimately their winning mentality. “Those at Leiston on Saturday didn’t get to enjoy a great game, even we have to admit that.